The beautiful cover is what initially drew me to this book – then the wonderful reviews, because it’s not something I’d typically pick up. The hint of the supernatural is what clenched it for me. The lyrical writing and atmospheric setting immediately reached out and lured me into this story and the Russian tales have delicious dark elements to them. Generally, I prefer a more fast-paced plot, but a gradual unfolding seems more appropriate for this type of book. The characters are fully-fleshed, especially the spirited and unconventional Vasya, and the dark forces are chilling – both figuratively and literally, as the characters in this book are freezing a good bit of the time. Something I struggled with was most of the characters going by a couple of different names and I was confused at times – but that may not be a problem for other readers. I’d recommend this to fans of fairy tales, folk lore, and Russian history – a bewitching and enchanting read. Thanks to Penguin First To Read for the digital copy for review. 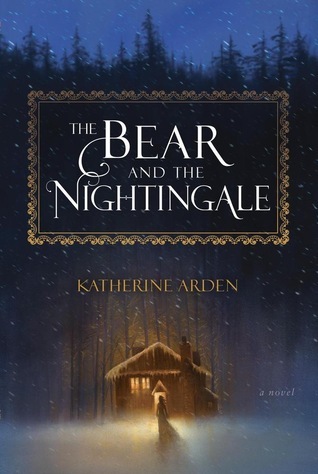 The Bear and the Nightingale is scheduled for publication January 10th, 2017. I loved this book too. I never heard of the Penguin First to Read program. I’m going to look it up! The program is points-based – accumulate points and save them to guarantee your request or enter drawings for books and save your points. I like it because I’m sure to get books I really want! Sounds interesting. I feel like I’ve seen that cover before – I agree it’s beautiful! It was something a little different for me, Barbara, but glad I ‘stepped outside the box’. That can be hard to do. I know I always gravitate to certain genres!